Today we have a new challenge on the Paperbabe Stamps Blog. This time around it a sketch theme. You can use the sketch any way you like, twist it, flip it or totally change it. The whole idea is that you let your imagination run free and have fun. I used the newly released White Rabbit template and Face stamps to create my main image. The background details were added using both the Herringbone stencil and elements from the Designa tweed stamp set. The sentiment is where your dreams take you (currently out of stock). 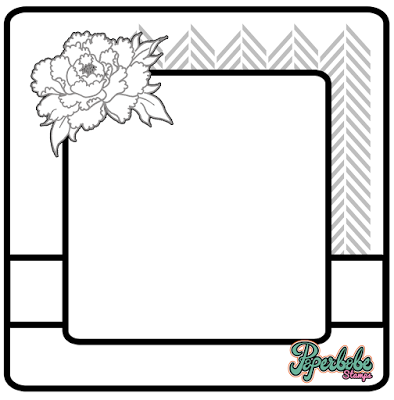 Lastly I added some roses using the Rose layers stamp set. To colour my image I used a combination of Neocolour II and Coloured graphite pencils. Now it's your turn, head on over to the blog and find all the details you need, including prize info....yes you heard me right there is a prize up for grabs. Thanks for stopping by, I can't wait to see what you make. I love how you have gently coloured your bunny and background Terri and those pastel Rosies work perfectly with your design. beautiful creation.